Chicken, quinoa, cheese, black beans, spices! Tortillas, more cheese, sauce! Eating, eating leftovers, eating moooore! And that’s the short story of this recipe. Okay, I know I’ve been on a roll with the recipe names lately 😁 but let me just take a second to assure you that you don’t have to identify with LAZY or GIRL to love this recipe. But if you do happen to be a lazy girl, let’s cover a few things. First of all, we are one in the same and I can feel you here on this blog in spirit. I say that I love to work hard, but that’s actually only true for about 1/10th of my life. What my inner LG really loves is super easy real food meals that are healthy enough to make me feel okay about skipping tonight’s workout in order to binge watching TV shows in my sweats on the couch. These are the things I love. Truly, madly, deeply. Fitspo much? I know you understand. And secondly -> 🏆🏆🏆 with this recipe. 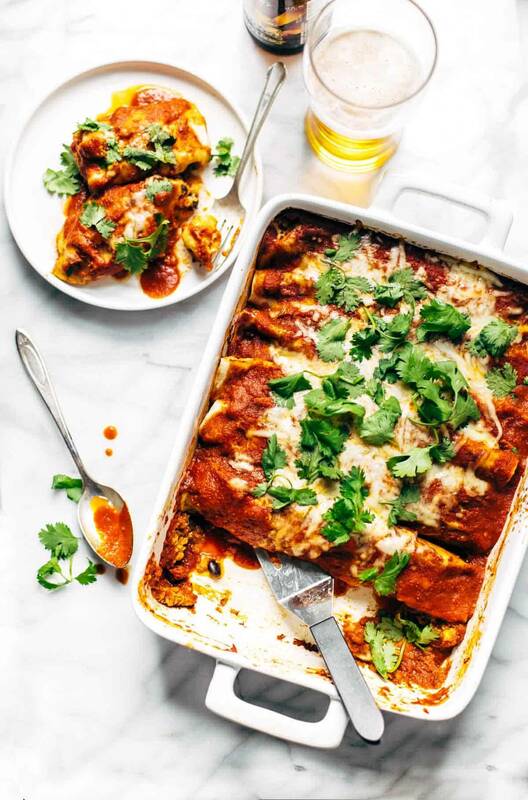 Let me be your fearless lazy girl leader for two seconds while I tell you that you can make this healthy + delicious enchilada filling all in one fell swoop – you will just dump everything in one big pot and you’ll be off and running to enchilada heaven. Sounds romantic, right? Secrets of the lazy girl club right here, friends. I’ll give it to you straight – you can use homemade or you can use canned with this recipe. This homemade version is worth the (very minimal) effort, because it’s essentially a five minute blender enchilada / all purpose Mexican-flavor-inspired sauce that goes with everything. It’s super easy. It’s really good. It’s made with legit TOMATOES (most enchilada sauce recipes don’t have tomatoes – does that seem weird to anyone else?) and onions and jalapeños and spices, pureed into a smooth-but-not-too-smooth sauce that feels real because it IS real. Oh, that? NBD – just a shot of the metal bowl of my rice cooker where I dumped everything in and stirred it all together. Okay, I’m almost done here (lazy girl wants to get another coffee and eat it with another chocolate chip cookie because sometimes that’s what she eats for breakfast ☕️) but one more topic of conversation. Yes – the crockpot works! 🎉 Put the same ingredients in the crockpot, maybe a little more liquid just to be safe, grease the sides so it doesn’t all stick, and cook on low while you’re at work all day. This can definitely work. Just be warned – if you use the crockpot, the texture of the filling will not be normal. The quinoa gets heavy and sticky, which is sort of meh. Then again, the reality is that this filling is going inside a tortilla, getting covered with sauce, and baking until semi-smushy anyways, so it’s not like the regular people of the world are going to notice a huge difference. As a better alternative, the rice cooker is fast and easy and it keeps the quinoa fluffy. It will all still be getting mixed with sauce and cheese and stuffed into a tortilla, sooo whether or not a person would notice the improved fluffiness is debatable. But I liked that it cooked super fast and maintained the original quinoa texture when I used the rice cooker, and that’s how I’d recommend doing it. Just hurry up and get started with these chicken quinoa enchiladas. DINNER TONIGHT. You won’t believe how easy this recipe is! Comfort food meets REAL food with healthy, simple ingredients. SO deliciously good! If the chicken breasts are large, cut them in half or in fourths. Put the quinoa, broth, and chicken in a rice cooker. Select the “white rice” setting – when it’s done, just double check that the chicken is cooked through. You can shred it with two forks directly in the pot. Pour about half of the sauce, half of the cheese, and the black beans directly into the rice cooker with the cooked quinoa and chicken – stir to combine. Preheat the oven to 400 degrees. Place a scoop of the quinoa chicken filling in the center of a tortilla. Roll up and place seam-side down in a 9×13 baking dish. Repeat until all tortillas are filled. Top with remaining sauce and cheese. Bake, covered, for 20 minutes or until the sauce is bubbly and the cheese is melted. Serve! Thanks for the simple enchilada sauce recipe, too. I hate using the cans, but…I’m a lazy girl! Sounds like I can make a batch and keep a jar in the fridge for dinner emergencies. You are so right, the enchilada stuff in cans tastes like aluminum. Like the can. Yuck! But hey, we can all be “lazy girls” from time to time. I love your idea of using leftover shredded pork!! And Lindsay, thanks for a nice cheesy recipe….I mean that in the best of ways!!! yep! I have some leftover sauce in my freezer right now as well! Hi Lindsay, you know what? I’m kind-of a lazy girl too. I would love to join your club and we could make Lazy Girl Enchiladas all the time. 😉 I think it is super cute when you use the smiley symbols and things like that in your writing. The confetti one made me smile. Thanks Melanie! 🙂 I love emojis. Pinned! This looks incredible! I had no idea that enchilada sauce is tomato-less. Crazy! I love how simple and easy you make this. Can’t wait to try this myself! Awesome! hope you like it Sydney! Tomato sauce-based enchilada sauce is a US invention. Traditional enchilada sauce is red-ish from chili powder, not tomatoes! I didn’t know that until I married into a Mexican family, and I will never go back to tomato (at least, not when my husband is around…jk, I use canned sometimes too). This looks marvelous! Yeah, the smoothness of the traditional sauce is hard to beat, but for this I just liked having the sauce actually having some weight and texture to it. 🙂 No claims to authenticity whatsoever. Do you have a good recipe for your homemade enchilada sauce? I find it interesting how varied the recipes are that I’m finding online. Oh, I totally hear that! Here is my recipe! haha, people do read it! Your blog is one of the only food blogs I actually read instead of just look at the pics, because you are hilarious Lindsay! These enchiladas look bomb, I will have to whip out the rice cooker! Slight confusion on your recipe instructions. No where do I see how to prep or do anything to the chicken. Do you put the whole chicken breasts in with the quinoa, do you cube them before hand, do you shred them up later after they’re cooked…??? I am a decent chef they can make a pretty good guess what I would do, but I would suggest you clarify this in the actual instructions for people who are not familiar with making enchiladas. And yes, I agree with the above post to the traditional red enchilada sauce is always made with dried chili powder, and not whole tomatoes. But, since you’re not planning to be traditional in any way here with the quinoa, I have to say this looks pretty tasty. Thanks for the suggestions John! made these this morning and they smell wonderful !!!!!!! i love using the rice cooker to make quinoa! i have one of those machines where the only two options are warm and cook, , so i just flip the switch to cook and let it go. perfect quinoa everytime. made quinoa on the stove last night and it was so much more of a hassle having to check on it so frequently. I know! It’s the best, that little rice cooker. Long time reader, first time commenter. I’m going to use this recipe as my intro to quinoa =) As a fellow LG, I will aspire to make the sauce from scratch but just in case I don’t, are there brands of enchilada sauce you recommend? Also, from a post so long ago about dog advice, this is for Sage: instead of filling our dog’s Kong with peanut butter, I put in the smaller treats and then stop it up with an ice cube. You may have to melt the ice cube enough that it fits, or if you’re truly a crazy dog person, you may have an ice tray specifically designated for the Kong where the cubes are all only half filled with water so that they fit into the Kong. 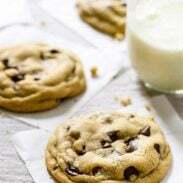 This is especially great when it’s hot outside, but it definitely takes them some time to get through the ice cube and may be healthier than always using peanut butter. Love the blog and recipes! And as for enchilada sauce, I don’t have a go-to brand. I usually look for whatever looks most authentically Mexican! This recipe looks amazing; however I don’t have a rice cooker. Perhaps you can elaborate on other yummy things to do with such a contraption so I can justify another kitchen gadget. Thanks and keep up the great work! Yes, I do read all of your words and love them. Especially the random emojis. 😉 With most blog posts I read until I’m bored and then go back through and look at the pictures haha. This recipe looks delicious and I’ve never tried to make my own enchilada sauce…if you’re a lazy girl call me SUPER DUPER lazy girl! Also love your white casserole dish…is that weird? Perfect for foodie photos!! Thanks Amanda! It’s from Crate and Barrel. Yes, it IS perfect for photos! Casseroles are a photo challenge for sure. Oh my this looks so great! My husband and I have both been traveling quite a bit, so I haven’t been making many full meals lately. And I totally miss it! I will certainly be adding this to my meal prep list when we’re both home together 🙂 AND I love that you included a recipe for the sauce. I’ve been making my own now and it is SO much better. So thank you!! Thanks Ashley! I feel ya on not making as many full meals… this was my gateway back into cooking after the craziness of the workshop. Yum! This looks delicious! I would love to make this. I don’t have a rice cooker though, so I would have to use my slow cooker. I especially can’t wait to try the enchilada sauce, I had no idea it is normally tomato-less. Pinned! Thanks Emily! 🙂 Hope you like it! you should do more LG friendly recipes!!!! I love this. Haha yes! I’ll just tag them LG. New code word. Sounds great! Can this be frozen? Yep! I just froze it before baking. Ok so I NEED a rice cooker – like, yesterday. It’s really is the most consistent way to cook grains! 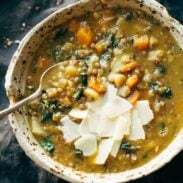 Have you tried cooking any ancient grains like farro or buckwheat in it? I’d like to know if that would work! Enchilada leftovers are zeee best! I have made vegetarian varieties before and loved them so I’ll have to try this recipe out! Yes indeed! Hope you like them Jessie! Wow, this looks so comforting and yummy for any day of the week. And that homemade sauce definitely looks like something I can get behind. Yum! Yay more mexican!! And Lazy ✔ Girl ✔ meaning this recipe was made for me. If it has cheese in it…we are friends. enchilada hater?! no such thing. I don’t have a rice cooker. Could I make this on the stovetop? yes, definitely. Just cook the chicken in a skillet and cook the quinoa according to stovetop package directions.